our garden is GROWING. I like to think it's because I have a green thumb ... but it could be because we have manure and compost galore, an incredible sprinkler system that J rigged for me, and Lee as my guide. alas, it's green and beautiful and I'm so proud of it. 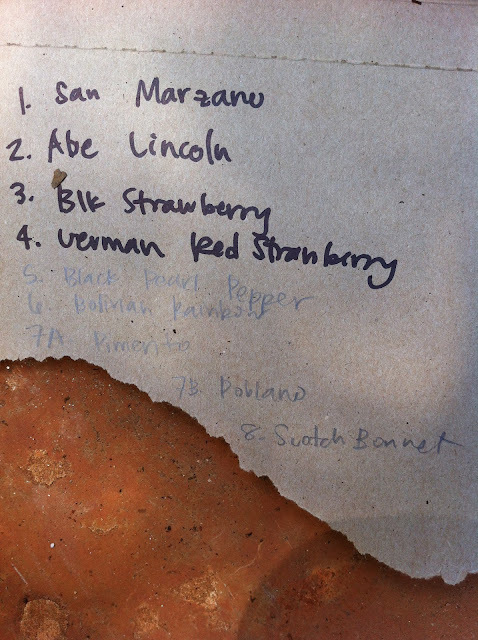 planted so far: tomatoes (from Normal Hardware. my seeds are started in the greenhouse to be transplanted soon), ghost pepper plant (from a man at our farmer's market, but again- seeds of other types are started in the greenhouse), basil and garlic (from our local markets), corn, squash and zucchini (from Lee), summer lettuce, okra, asparagus, leeks, 2 types of radishes, beets, chives, and 3 types of carrots (all roots/seeds from Landreth Seed Co.). we rose separately this morning, brewed coffee and took a walk to Lee's. (exciting things happening with EE.) afterwards, we got eggs from our chickens, harvested radishes, and put it all together for bfast. YUM.